Baseball and barbecue always seem to be the right combination for us in terms of getting to sample some new Que and today was no different. 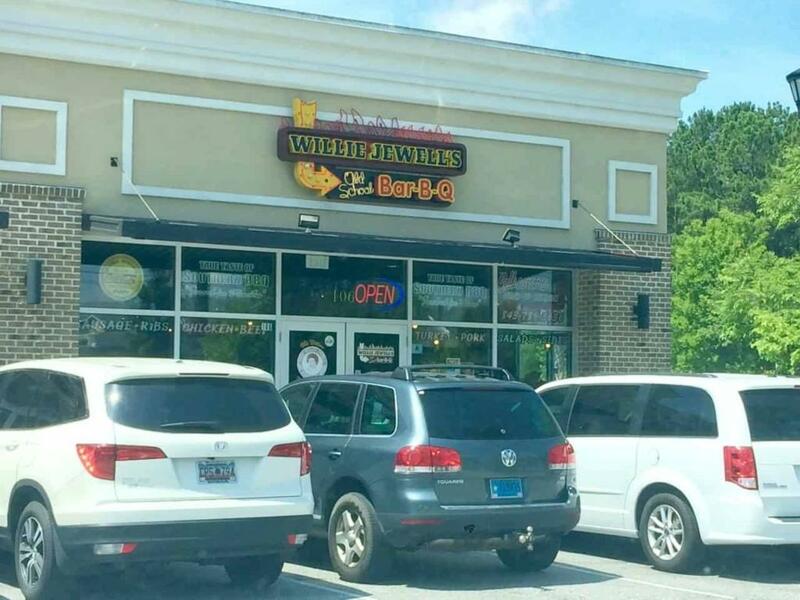 Camden was at Charleston Southern’s baseball prospect camp today, and when they broke for lunch, I had the opportunity to go off alone and check out Willie Jewell’s Old School BBQ, which is just down the road from the CSU campus. 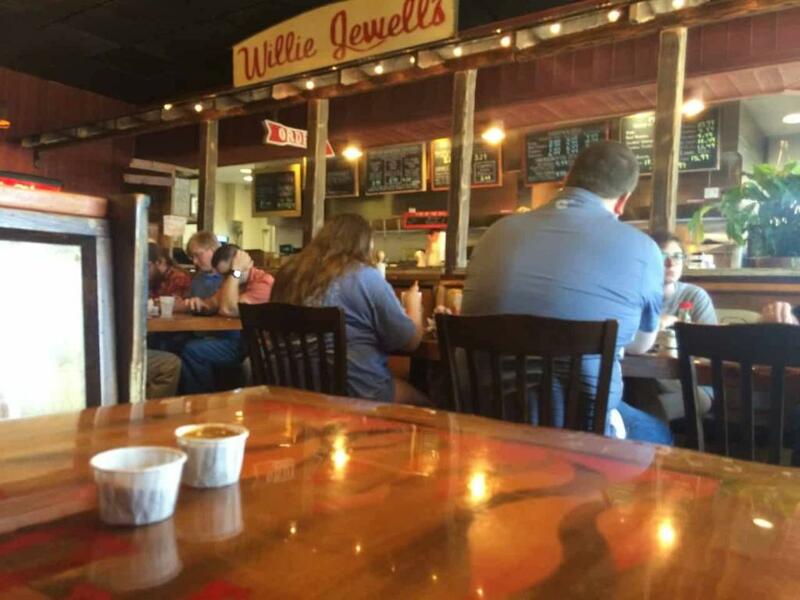 You will find Willie Jewell’s on the right-hand side of Hwy 78 (aka University Blvd. which runs in front of CSU) about a mile past the campus heading toward North Charleston and Rivers Avenue. 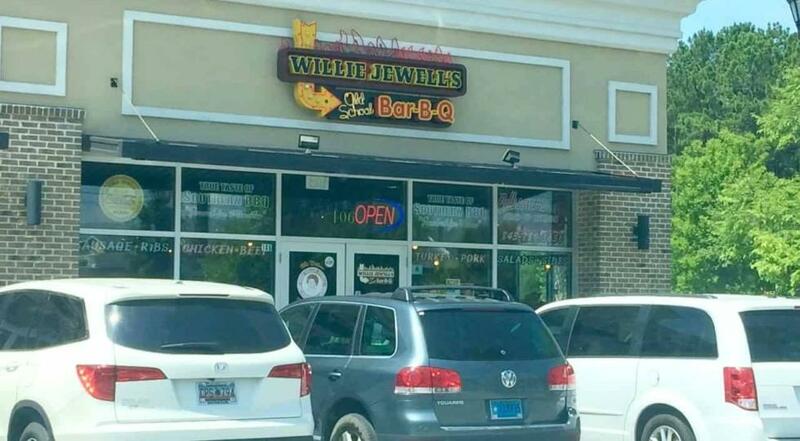 Willie Jewell’s occupies the right, corner unit in a nicely maintained strip mall. I took it as a good sign that the first thing that hit me when I opened my car doors was the smell of smoke. The air in Charleston can be heavy in mid-June, but at least this air was laden with a smoky fragrance. 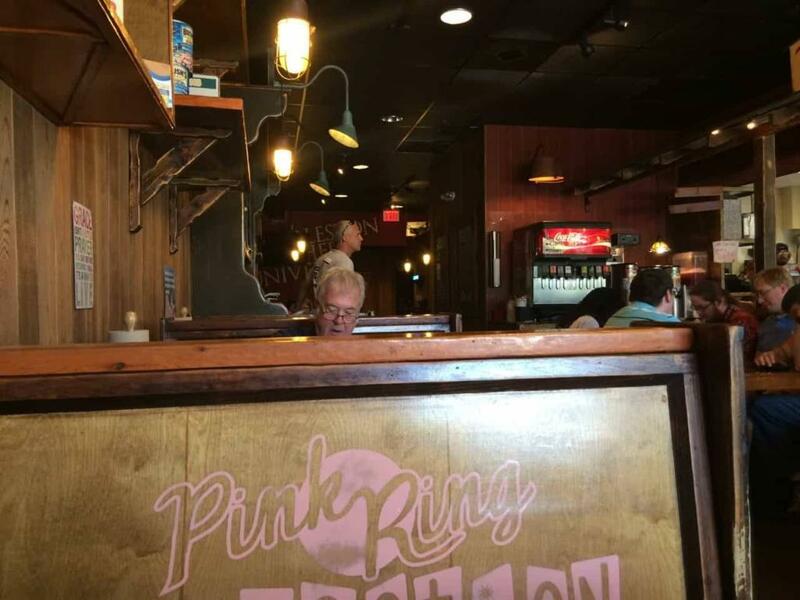 I stepped inside right behind a group of five dining individually, yet together, for lunch. Willie Jewell’s is nicely adorned in typical BBQ regalia: wood-paneled walls decorated with old-school nuances, giving it the feel of an old barn on the inside. In relatively quick fashion, I stepped up, gave my name (they deliver to your table), and ordered a pulled pork sandwich with collards as a side. I paid my bill of about $12 and was handed a styrofoam cup. I filled the cup with ice and sweet tea, which is almost always my beverage of choice when dining out, and made my way to the sauce bar. The sauce bar is spacious and has a number of hot sauces, bbq sauces, condiments, utensils and the like. There are 4 BBQ sauces in what I think are warming pumps on the bar: Lowcountry Gold, Hot Momma, Sweet and Sassy, and Hickory Heaven. I got a small paper condiment cup full of the Lowcountry and Hickory sauces to start and took a seat in a booth near the front corner of the restaurant. As I waited, I noted that the place was busy but not full at around 11:30 am. The lunch crowd was not yet free to descend on the place like I suspect they do daily. In quick order, my food was delivered. On the table was a small bottle of vinegar stuffed with hot peppers, the perfect accompaniment for the collards. I doused the cup of collards with a healthy serving of vinegar and took a bite. That said, I have read complaints on review sites that the collards have a lot of stems in them. I did not find this to be the case with my serving. Next, I turned my attention to the sandwich. I began by pouring about half the Lowcountry mustard sauce on half of the sandwich, leaving the other side open to sample a different sauce. 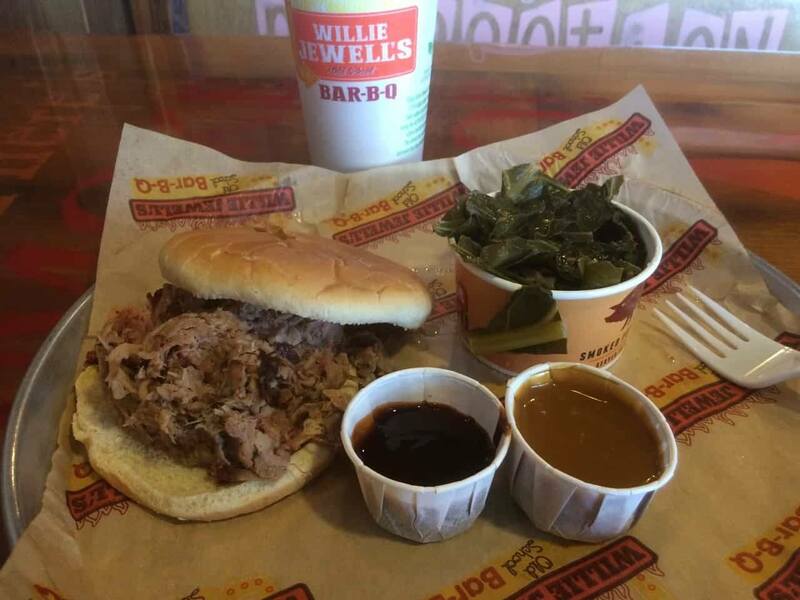 “The pulled pork sandwich was a nice serving, probably a half a cup of meat, I would guess…maybe a little bit more,” I noted. “The bun was a typical white bread bun. It was either lightly toasted or slightly stale. Honestly, I could not tell you which, but it wasn’t bad, anyway, and that did not detract from the overall,” I concluded. 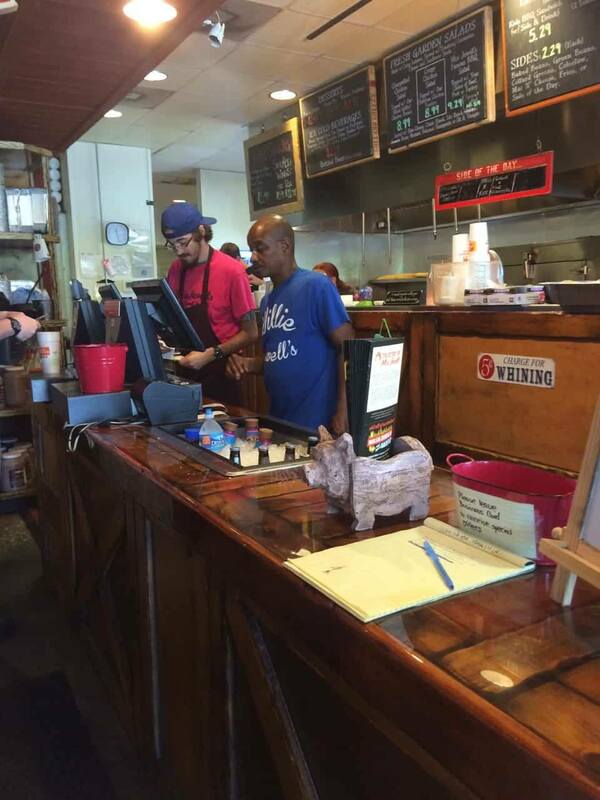 “As for the barbecue itself, I know it was cooked in a Southern Pride Smoker because it was right there behind the main counter. The pork had a fair amount of smoke flavor and also contained some nice flavorful and chewy exterior bits. Unfortunately, it was basically overcooked, a little bit mushy…not too bad in that sense, but definitely on the soft side,” I noticed. After taking a few bites of the sandwich, I discarded the bun. Not because it was bad, but because I wanted to eat the BBQ alone without the bread. This would give me a chance to sample each of the sauces. Headed back to the bar for a sweet tea refill and to get the other two sauces on the bar. While there, I spotted a lonely bottle of vinegar-pepper BBQ sauce that was on the side away from the main kettles of sauce, so I filled a third cup with the bonus sauce and headed back to my seat. I pulled aside a small portion of the pork and hit it heavy with a dose of the vinegar sauce. “The vinegar– pepper sauce was mediocre at best. It’s like, ‘Okay, we are in South Carolina, so we better give them a vinegar pepper sauce.’ The sauce was light on the pepper, light on the “vinegariness,” and fine on the saltiness, but I would not eat it again,” I recalled. I went back to the mustard sauce. Next, I sampled the Sweet and Sassy sauce. I didn’t go back to that one. Next, I sampled the Hot Momma. As for the other factors, the service was good, and the people were nice and pretty fast and efficient. It’s a good lunch, and, of course, this was just one visit with a small sampling from a much more extensive menu, so your mileage may vary. I certainly don’t hesitate to suggest you drop in and give it a try when in the area.